A significant part of being in community as Christians is the care and compassion we share with those beyond our walls and in the communities in which we live. Holy Hammers: We help build a home in April and May of each year, and contribute to this regional expression of Habitat for Humanity. 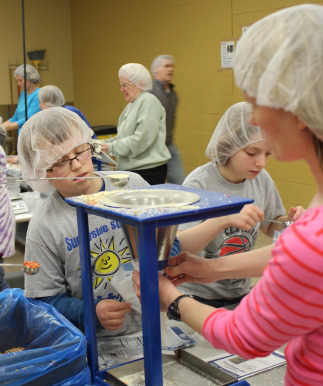 Loaves & Fishes: We have three opportunities to serve a meal at St. Stephen's Church in Minneapolis each year. The Social Concerns Network: This is a coalition of New Brighton area churches. It hosts a number of activities each year to serve this community, including a pancake breakfast, a coat drive, and the Walk a Mile for Our Neighbor event. The Community Emergency Assistance Program (CEAP): We give generously to this agency that helps us meet the emergency needs of people in our own community. Harmony Hat Makers: Inspired by the prevalent need for warm hats by immigrants and others through our long winters, this group of fastidious sewers meets once a month and produces approximately 1,000 hats each year! We meet on the 2nd Saturday of the month from 9:00 to 11:30 a.m. You do not need to know how to sew— you can cut, coordinate, and converse. Our members are also often involved in a variety of other opportunities to show love and compassion beyond our walls, including trips to Feed My Starving Children, the Ralph Reeder Food Shelf, Loaves & Fishes, Meels on Wheels, Habitat for Humanity Mission Trips to Mississippi and South Dakota, and participation in the construction of PET's (Personal Energy Transports - hand-peddled ATV's that are sent to peolple with mobility issues in other countries) with PETMN, and many others. See Our Affiliations to learn about our partnerships with other organizations.